Mercedes Benz/New York Fashion Week 2014 has come to an end. It was sad to say goodbye, but on February 12th I had the opportunity to attend my first NOLCHA FASHION WEEK to view five Independent fashion designers. 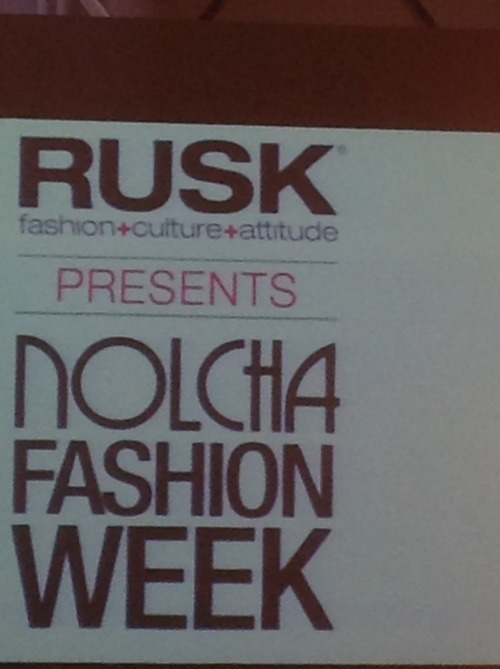 NOLCHA allows up-and-coming designers to not only express themselves, but gives them a platform to be discovered. For newbies without the powerhouse names of Marc Jacobs, Chanel, or Oscar De La Renta, NOLCHA can be the start of their career. Fall/Winter 2014 collections were presented by: Nina Athanasious, Dany Tabet, Jungwon, L. Catherine London, and Gabrielle Arruda. Among the celebrity guests were: Derek J (“Housewives of Atlanta”and “Fashion Queen”), Kelly Rutherford Deane (“Gossip Girl” and “Being Mary Jane”), Zendaya (Disney Channel series “Shake It Up”), and many more. The showstopper of the night was Dany Tabet. The Fashion World needs to keep an eye out for him. Dany gave the audience something spectacular, stunning, and full of personality. Some of the designers started their show with a video. Others used music to represent their line. That was okay, but Dany, a 5’3” Lebanese man, commanded the room with his voice alone. I was moved by the story of why he created his line (to celebrate the shape and beauty of women inside and out), and how he was influenced by the war in the Middle East. He called it the “Crystal Warriors” line.